An ocassional journal chronicling the author's adventures in genealogy and the exploration of his American family of families. Follow us now to http://blog.geneablogie.net! We'll be boarding this old place up in just a few days . . . Through a series of unfortunate circumstances, I've been blessed with a bounteous trove of genealogical riches, nearly more than one person can handle. We've been slowly and carefully going through boxes of documents and photographs (and at the rate we're going, we're likely to spend the next 15 years at this! For this Carnival, I thought I would give you a glimpse of some of the stuff. You'll see the challenges and the joys ahead. You can enlarge any image by clicking on it. First, there is this curious picture below, which I call "Children in Wagon." I think that there are actually two, maybe even three adults in the picture. I have no idea when or where the photo was taken. 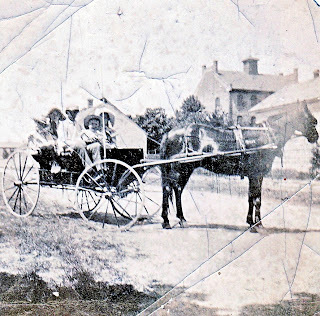 I do suspect that it was taken in either Illinois or Missouri. On the back of the original is the handwritten notation "For Francis." That could refer to a number of family members, none of whom seem to be in the picture. Or it may refer to someone other than a family member. The problem is that the people most likely to know have all passed away. The photograph on the right I labelled "Young Woman." Again, we have no idea of the woman's identity or when the photo was taken. We do have several clues, however. On part of the original which I have covered with the frame here, there is the embossed name and address "Maxwell, 2607 Lawton Ave, St Louis, Mo". This apparently refers to photographer William C. Maxwell, who had a studio in St Louis from at least 1910 until at least 1915. See Early St. Louis Photographers. I haven't found any evidence that the business still exists. The other potential clues about "Young Woman" are that this was actually a post card. I've come across several post cards with identifiable family members in them, leading me to believe that this was a popular way in which to send pictures in the early part of the twentieth century. Below is the "Young Woman" post card. You can see what kind of shape the photograph is in by looking at the post card back. And I'm not sure that it isn't "McQuin." There were families named Quin and McQuin in St Louis in the period that Maxwell could have made the portrait. But beyond that, nothing else is known to me about the photo. The next photograph I call "Surly Woman, Distracted Man." I have no idea who these people are or when or where the photograph was made. I presume that their clothes are a clue. Notice how the man has his right hand tucked inside his coat. And what does the sign behind the man's head say? Another challenge for you photo-sleuths! Finally, I've come to realize that a lot of the material may be valuable to researchers looking at other families. So from time to time, I'll share some things that may be of broad interest. 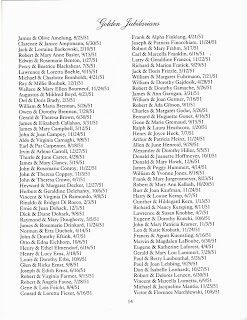 Today, somewhat apropos of a Carnival, here's a list of couples who were feted on their 50th (or greater!) 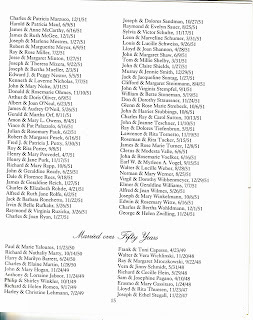 wedding anniversary in the Archdiocese of St Louis in 2001. See if one of your surnames is there! 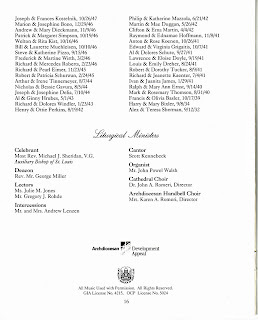 [Click on pages to enlarge]. "The first U.S. postcards were "postals," issued by the Post Office in 1873, with a 1[cent] stamp printed directly on the card. The first picture postcards in the United States were souvenirs of the Columbian Exposition, held in Chicago in 1893. 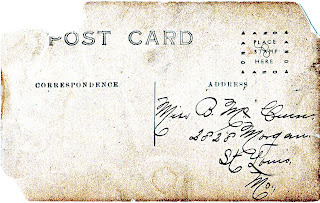 These were extremely popular, and on May 19, 1898, Congress authorized the use of privately produced postcards, called Private Mailing Cards, with the same 1[cent] rate as the government postal cards. The backs of these cards were reserved solely for the address, and manufacturers left a margin around the image on front for a short message. On December 24, 1901, postal regulations were changed to allow private printers to use "Postcard" or "Post Card" on their products. These cards are referred to as "undivided backs," as the reverse was still used just for the address. On March 1, 1907, new regulations divided the back of the postcard between the address and a message and the front of the card is now used entirely for the view." This should help narrow down your research a bit. Thanks, Denise. That's quite interesting and very helpful. Just a quick look at your postcard. The area that contained the stamp is marked AZO with four upward pointing triangles. This is called a "Stampbox Marking" and indicates the years 1904 - 1918. That's very helpful. What exactly does the "AZO" stand for? It was the equivalent of today’s “printed on Kodak Paper.” AZO identifies the manufacturer of the paper the postcard was printed on. AZO is a silver chloride photographic paper first introduced by the Photo Materials Company in Rochester in 1898. In July of 1898 Kodak bought out Photo Materials and has been producing AZO ever since. The Eastman Kodak Company, added AZO photographic postcard stock to its postcard line in 1904. The earliest your postcard could be. Love those little clues, don't you? I don't believe that is a sign behind the distracted man. I am not sure of the correct architectural term, but I believe it is a decorative brick alignment over a window on the exterior of a house. The same thing can be seen in the photo of the Campbell house, Carrollton, Missouri, on North Folger Street in my post John Campbell Is Dead. Napoleon is known for placing his hand in his uniform jacket. I recently read a book about medical conditions that said it had to do with severe pain from a medical condition. 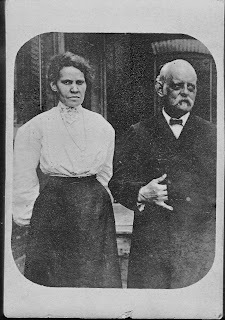 Perhaps you've discovered a family medical condition in an old photo. Or maybe just an itch. Congratulations on your find! That is truly a blessing! Which side of your family does the pictures and documents pertain to? Any Brayboy, Hines or Jeffersons? By the way, I have a postcard photograph of my gg-greatmother Margie and her son Huey that looks very similar to the one you posted and it was taken around 1916-1918 because my uncle Huey looks between 3-5 years old and I know that he was born in 1912. Hope this helps. Also, do you know who the addressee is on the postcard? No, unfortunately, no Brayboys, et al., in this part of the family. But who knows?! I don't know the addressee; I tried to find a match in the census records, but struck out. Maybe somebody will read this and recognize the name. 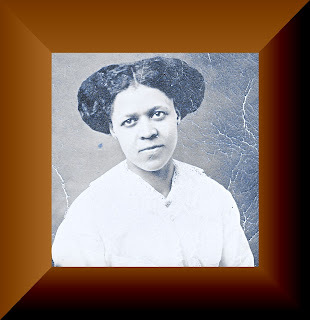 Craig - I don't have near the amount of genealogical related items you have - but when I found my treasure, it sure was fun to go through everything!